I had a hankering to make some things this weekend – dye some eggs, make some chocolates, bake meringues or something – but instead I mostly just sat around. I found a cake recipe that seemed to satisfy some of those needs -it required melting chocolate and whipping eggs – but it was a flourless cake recipe, and I just couldn’t believe that it was possible to make a cake with no flour. How does that become ‘cake’? I wanted to make it on Saturday for Easter lunch but it is ‘best served on the day it’s made’. So I got all the ingredients ready to go the night before and then woke up early on Sunday so I could mix, bake, and pre-roll it so it could cool while we went to church. If you’re interested in the how-to, you should really read the original post. I would just like to say that this is the first time in a long time that I actually followed almost every single direction of a recipe. The only problem I had was that my pan wasn’t quite big enough. 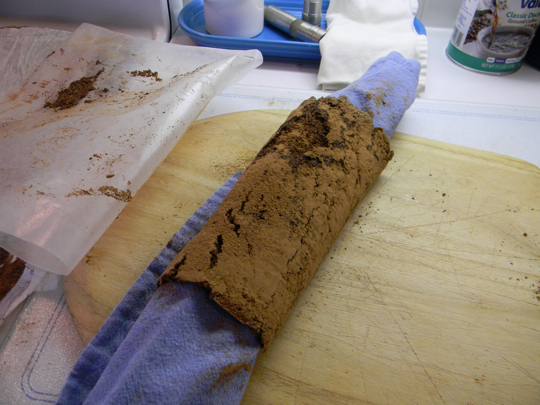 After baking, you let it cool a bit with wet paper towels on it (really), then sift cocoa all over both sides, roll it up in a towel and let it sit so it ‘sets’ in a curve. 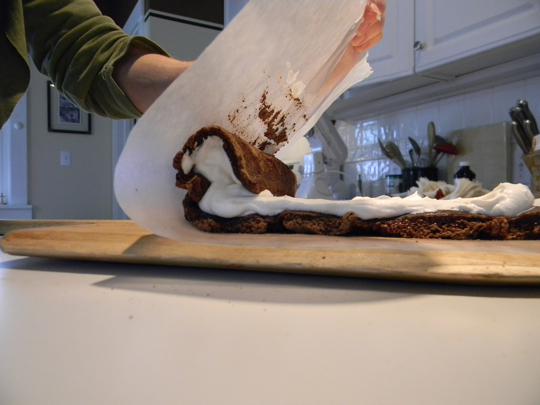 After it’s cooled all the way, you unroll it, slather whipped cream on top, then re-roll. That was the part that I really wanted to do. 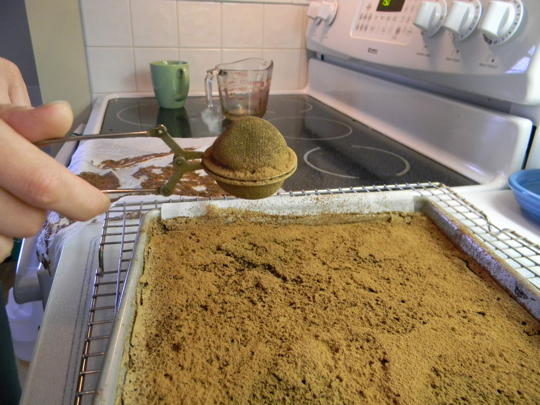 In fact, I’d really like to make this cake again so I could practice my cake-rolling skills, but then I’d have to eat cake all the time, and that’s not really my thing. Any bakeries out there looking for a cake-rolling apprentice? See, I really need to practice because this thing was ugly. Like ‘this cake has a nice personality’ kind of ugly. 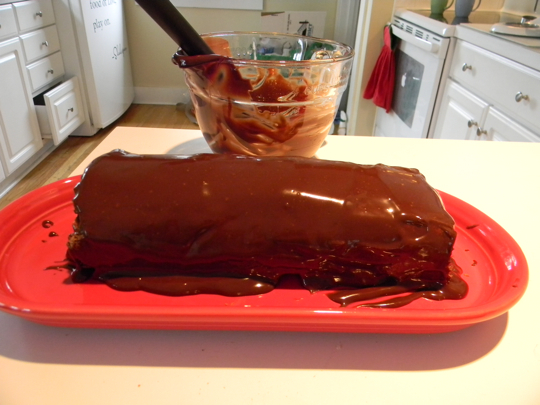 I decided to fix it by making some ganache, but first I had to learn how to spell ganache. Using some hot cream and the rest of Lloyd’s ‘secret’ stash of dark chocolate, in minutes I had a giant Ho Ho. It tasted alright, but I think I’d like to try this again sometime with a cake that has flour in it. So if I’m reading that recipe correctly, the “cake” part is just a bunch of eggs with some stuff in them? I talked on the phone with my mom last night and she said everybody loved eating this. Yes -- eggs, chocolate, sugar and a pinch of salt. 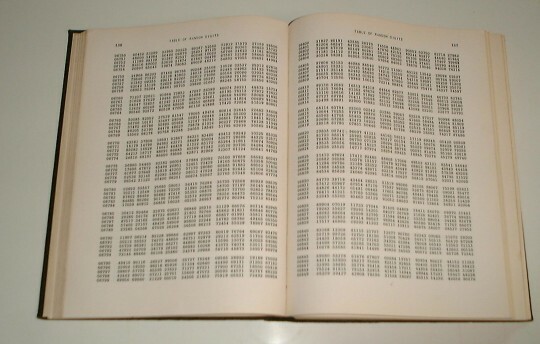 Bizzare, huh? Wait! I have a secret stash of dark chocolate? Mmmmmm!!! A giant Ho Ho!! Did you happen to get a picture after you sliced it? Wouldn’t one of your tiny lasagnas & this colossal dessert make an intersting dinner? why would anyone roll something so yummy in pecans?? Ice cream idea is a winner! Would you have to soften first, then freeze? 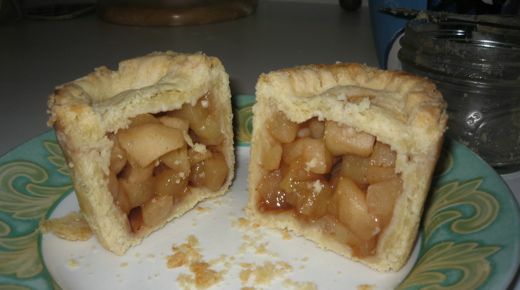 Mmmmm…..looks good. Just an FYI….they are selling half-off certificates to Two Twins Cafe.